Graveside services for Doris Lee, age 88, of Centerville, will be held at 2 P.M., Friday, July 20, 2018 at the Allphin Cemetery outside of Midway, Texas. Grandson, Mitchell Fickey, will officiate the service. Doris Marie Lee was born January 20, 1930 in Frost, Texas to John & Rosie (Ellis) Mitchell. As a Baptist Minister’s wife, Doris lived in various places. While living in Madisonville, she did cleaning work for a janitorial service. In her later years, Doris lived with, and was taken care of, by both of her daughters. 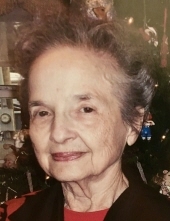 Doris passed away July 15, 2018 in Centerville, Texas. She was preceded in death by both of her parents; husband, Ralph Lee and son, William “Randy” Lee. She is survived by daughters, Catherine Stokes (David) of Hudson, N.C. and Carolyn Fickey (Kenneth) of Centerville and grandchildren, Rose King (Scotty), Richard Felton (Linda), Kenny Fickey (Amy), Mitchell Fickey (Katie), Amy Felton and Lysa Ferguson (Tyler). Doris is also survived by great grandchildren, Stormy Hampton (Jared), Clara King, Brady Fickey, Brody Fickey, Rylan Fickey, Addie Fickey, Thomas King, Kasyn Fickey, Sam Fickey, Josiah Fickey, Destyn Fickie, Peyton Felton, Serella Slatt, Caroll Yaneell, Axton Ferguson and Brityn Ferguson. To send flowers or a remembrance gift to the family of Doris Marie Lee, please visit our Tribute Store. "Email Address" would like to share the life celebration of Doris Marie Lee. Click on the "link" to go to share a favorite memory or leave a condolence message for the family.